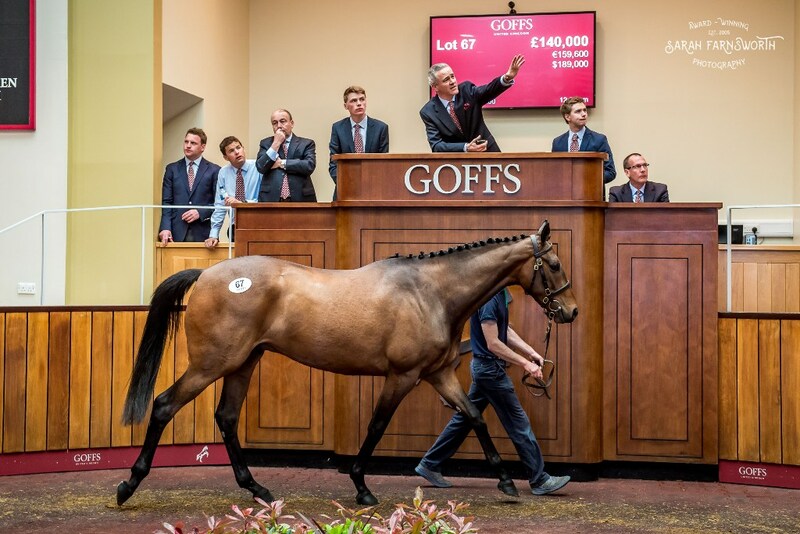 A large buying bench and a high demand for Stores at all levels of the market translated into a successful renewal of the Goffs UK Spring Store Sale at Doncaster today which sold the highest priced Store in over 10 years. The unofficial end of NH season finale, the three-day Spring Sale attracts a huge buying bench every year and today was no exception with the industry’s leading players in attendance for the Store Session which achieved a clearance rate of 83%. Topping today’s sale was Ballincurrig House’s Kayf Tara gelding out of the Listed placed mare Novacella (Lot 67) who sold to trainer Gordon Elliott for £140,000. The gelding was one of 27 Stores to sell in excess of £50,000 today, beating the number sold at last year’s record breaking sale. Other lots to feature included Ballyreddin Stud’s Getaway half-brother to the Gr.1 winner Klepht (Lot 164) who sold to Kieran McManus for £88,000, the late selling Great Pretender gelding from Ballincurrig House (Lot 265) who sold to Kevin Ross Bloodstock for £75,000, RH Bloodstock’s Al Namix gelding (Lot 90) who was purchased by Tom Malone and Paul Nicholls for £70,000 and Chapel Lane Bloodstock’s Jeremy gelding (Lot 176) who was also knocked down to Kieran McManus for £70,000. “To sell the highest priced store in over a decade is testament to the enduring appeal of the Doncaster Spring Sale. Last year we celebrated a record Store Sale, with the average and median growing by 22% and 15% respectively, so to grow that median again demonstrates that the sale continues to progress and evolve." "We had another wonderful attendance with a huge number of owners, trainers and agents on-site and the demand for horses was strong at all levels, particularly in the middle market, which ensured we finished with a high clearance rate." The Spring Sale continues tomorrow with the two-day Spring HIT/P2P Sale which will start at 11am and will offer over 450 lots. Tomorrow’s opening session will offer some top-class Point-to-Pointers alongside select Horses-in-Training drafts including the Million In Mind Dispersal.